Let’s put this notion to rest before we even start–you don’t have to be Instagram famous for your brand to see the best results. Learning how to be successful on Instagram isn’t just about follower count. Instead, success comes from engaged audiences and great content. Creating a great Instagram campaign is like any other marketing strategy. It always takes more effort than you think and needs to be well thought out before you start. We’ve put together a simple, but highly effective, five-step guide on how to be successful on Instagram. Follow these tips to get your Instagram strategy started. Far too often, brands think it’s just fine to post a few photos or videos, and wait for the audience to come rushing in. That’s simply just not the case with Instagram. Instead, you have to build a content strategy just like you would for any other marketing campaign. Step 1: Research the bests posts in your industry. Get started by tracking your competitors. Find 5-10 competitors (or similar brands) and document their top posts within the last few months. Mark all commonalities (product-related, bright colors, photos of people, etc.) and see what works. This isn’t an excuse to be a copycat, but it will help you build your content. Step 3: Try to be as unique as possible with your content. While that’s easier said than done, creative play on Instagram works. Whether its the endless table by Reynold’s Wrap or the consistent bright color theme of Bioré, themes work. Step 4: Invest in photo editing tools for your content. Whether it’s Adobe Photoshop or VSCO, your content has to be in stellar condition. Beautiful, breath-taking photography always gets your viewers’ attention. It might seem like a lot of work at first just to build out content, but the rewards are worth it. Better content leads to more engagement. When followers truthfully like what you post, you’re increasing your chances of converting them to a lead or customer. As a brand on social, you need some form of marketability. It’s walking a thin line between being promotional and resourceful. 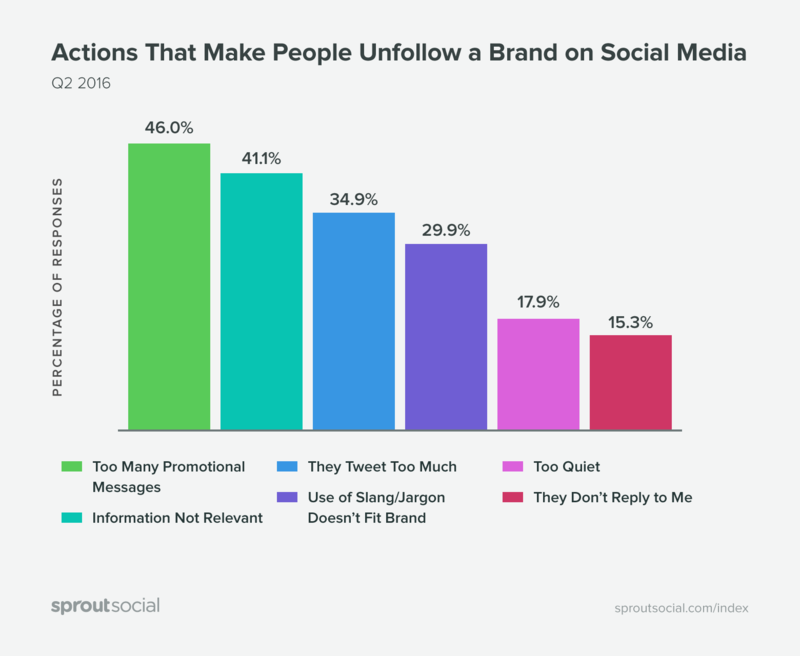 According to our 2016 Sprout Social Q3 Index, 57% of users unfollow brands on social because they’re too promotional. To avoid being overly promotional and to still market your brand, consider branded hashtags. An important stat to know is 7 out of 10 hashtags on Instagram are branded. This means your hashtag has to be unique, memorable and engaging. For example, Thrive Market uses the hashtag #letsthrive to promote user-generated content on Instagram. The hashtags works as a source of interaction between the brand and users. Instead of a promotion, you’re highlighting your users. Remember to fully inspect your chosen hashtag as sometimes it can be associated with something else. Avoid the embarrassment and be thorough with your hashtag campaign. It’s critical to know how your hashtags perform so you can make adjustments before it’s too late. With the help of Sprout Social’s hashtag analytics tools, you can easily gain insights into your top keywords and most engaged hashtags on Instagram. 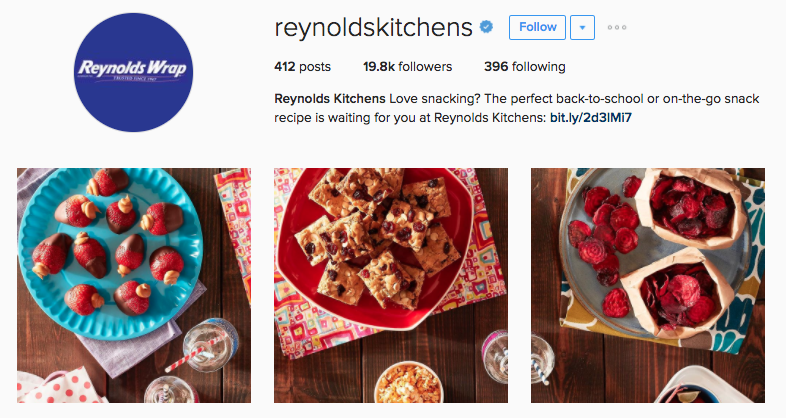 Additionally, you can see if your keywords are sticking with your Instagram audience. Sprout can pull hashtags commonly mentioned with your brand in its Trends Report, so you gain context into what people say about your brand. 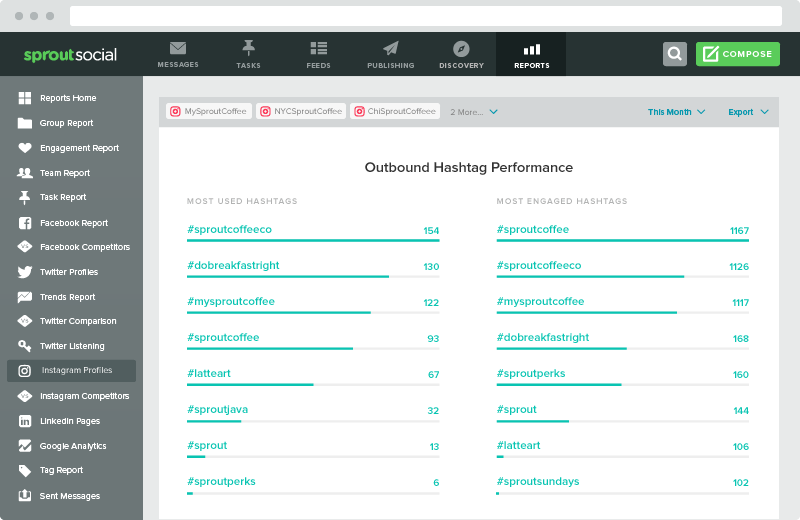 Analyze your results or compare hashtags to know what works best. 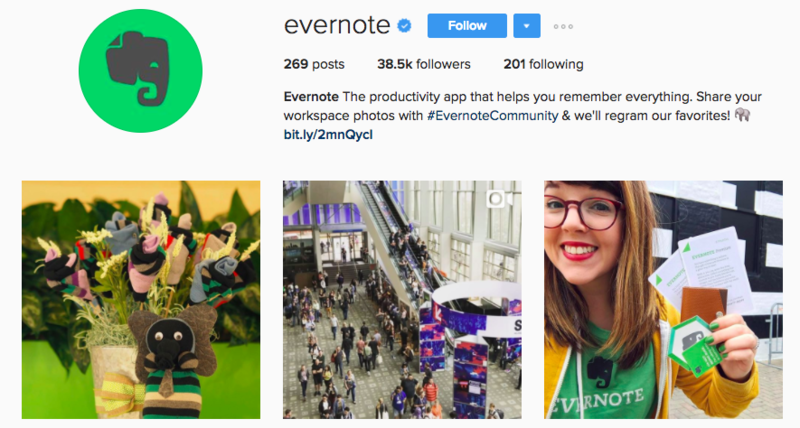 Here’s a question every company should ask themselves about its Instagram strategy–what drives users to follow your brand? Like we mentioned before, having gorgeous photos certainly helps engage users. However, what are you telling your audience if you don’t have an appropriate call to action? Instagram captions are essential to your content because it gives users a reason for your content. For example, Bucketfeet, a shoe manufacturer, uses Instagram captions to highlight collaborations, new designs and styles available. Without any context, you’d think this shoe design was normal or always available. But the company highlights its limited edition run to nudge users to purchase now. Captions provide great opportunities to use your newly developed branded hashtags and call-to-action phrases. Instagram is unique because it allows only one link located in the user bio. While there’s still no way to organically post links in posts, your call to actions have to move people to your bio. That’s why we recommend never settling on a stale website link in your bio. It should be changed weekly and sometimes even daily (depending on how much promotional content you share). Also, it’s best practice to avoid linking straight to your homepage. There’s little incentive for a user to go directly to your homepage when you can move users down your marketing funnel more effectively with a specific landing page. Evernote does this to promote its latest collaborations and speaking events. The company posts a link that directs users to the SXSW speaking sessions. But their link also has a direct button to get Evernote as well. By using a unique landing page, you direct users from specific content to an informative site that provides more details. At the same time, use your space to engage with users and follow them if they produce content relevant to your industry. Urban Outfitters regularly posts user-generated content from artists, photographers and collaborating designers. Some of your biggest fans might already be producing great Instagram content. Try to see how they can collaborate with your brand to work out for both parties. No one really wants to talk to an automated message, so avoid robotic replies. 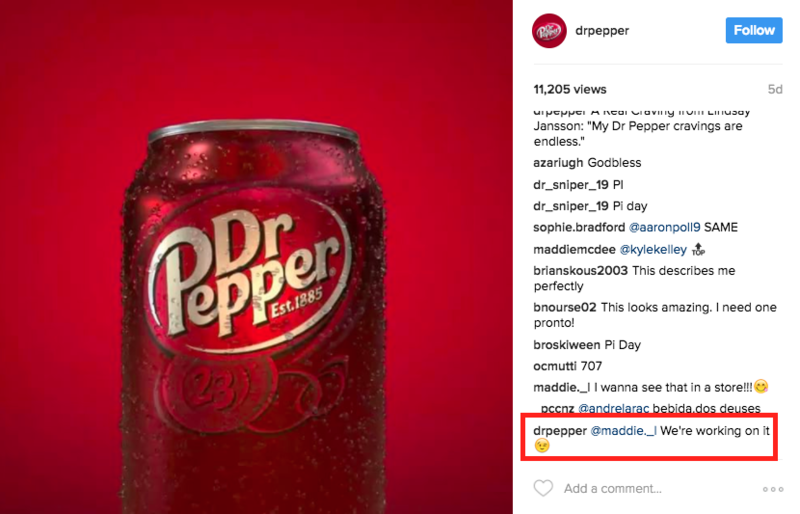 Even big brands like Dr. Pepper find the time to respond back to followers with quippy and fun responses. It doesn’t have to be a full on conversation, but replying can do wonders to your Instagram engagement. According to our Sprout Social 2016 Q2 Index, 1 in 3 users will go to a competitor if they’re ignored on social. This should mean everything to your business on Instagram. Unanswered questions leave a bad taste in people’s mouths. So make sure you’re willing to put in the effort to respond to those in need. If you want recommendations and good reviews, be ready to use Instagram as a source of information and connectivity. As we previously mentioned, many brands incorporate user-generated content to connect with users, collaborate on content and promote one another’s Instagram. But these people don’t need 1 million users or have to be a celebrity to help you gain more exposure. Step 1: Use BuzzSumo to find your industry leaders and follow them. This is a great way to find lesser-known influencers with a core demographic following in your specific industry. Step 2: Engage with influencers and don’t jump straight to asking about collaborations. Comment on their content or ask a few questions that are related to your industry. Then you can ask the bigger question. Step 3: Start small. More likely than not, top tier influencers have already been contacted or possibly have a process in place for collaborations. Start on the smaller side and build your way up to those who have massive followings. It’s smart to nurture and value your connections because just like your audience, influencers deal with robotic messages all the time. Try to build real relationships by meeting up at industry events or asking to host joint webinars. There’s a lot of ways to connect, but if you do it right, your Instagram will be a source of entertainment and information for your audience.